I really think I am an optimist, but the last few days have been quite a test of my optimism. So I figured I'd write about all the yucky stuff, find the good in each situation, and throw in a few pictures that are making my happy, despite all the doom and gloom around here. First of all, there were the shingles and chimney blown off our roof. That's not so terrible, except for the $500 deductible on our insurance, but at least we have insurance, right? And when it's all done, we can enjoy a cozy fire in our wood-burning stove. I'm not sure when that will be, however, as the winds were still pretty bad yesterday, and the tarp was blowing all over. 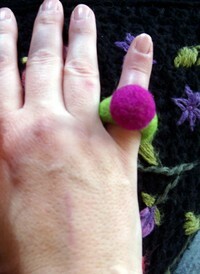 It's kind of funky and fun, and very cozy to wear. It was fun to make, and I've got some fun ideas for lots more of these little babies, so they may show up in my shop soon. Saturday, as you may have heard, was (very nearly) record-breakingly cold. Of course, we live in the mountains, so it gets cold, and I like cold weather better than hot, but we're talking way below freezing, for days on end. So Sunday morning, when it managed to get above freezing for a little bit, we heard a very loud bang and a whoosh of water. Not good. A pipe under our front porch had burst. So we had to turn off the water for three days. Luckily, it was under the porch, not the house, so the water just flowed into the yard, and also luckily, we were home, so we were able to shut it off right away. So there was no damage to the house, and not a lot of water was wasted. Living without water is very not fun. We did, however, occasionally turn the water back on so we could flush. It was a little wasteful, but we weighed our options, and decided it was worth it. Sometimes you just have to do what you have to do. By the end of the second day, we were pretty disgusted with ourselves and decided to waste a little more and take really really really fast showers. Boy oh boy, did that feel good! The plumber came yesterday and fixed everything up, and it was only $150 which goes toward that $500 deductible that we were already out, so that's not too bad after all. Other people had it much, much worse. I made a little sundress with some vintage eyelet and linen. I even made some pink striped stockings to go with it. I have a little jacket planned to go over it. And then I think this is my favorite outfit so far, a linen butcher's style apron over and pleated skirt and lace-edged t-shirt. 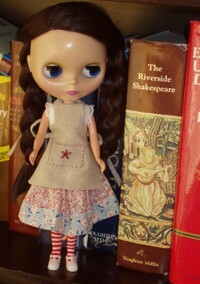 Apparently, Evie likes the Classics, she was hanging with Shakespeare and Chaucer this morning. I forgot to mention that Evie made the trip to Boise with me, and she was a big hit with one niece so far. 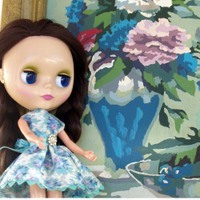 We had to change her eyes frequently, but Evie came through it all with flying colors. 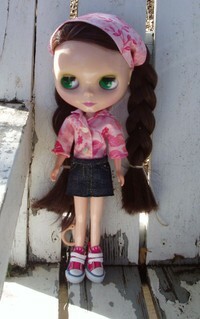 I still need to work on my Blythe photography skills. Yesterday I went out to my car to go to lunch. I started it up, backed out of my parking space, and started to pull forward, and a couple lights came on the dashboard. One of them was the EPS light, which came on last year, when my timing belt broke and took out half the engine with it. I called a tow truck and had it towed, and spent a sleepless night worried that we were going to have another thousands and thousands of dollar repair bill. Luckily, the dealer called this morning to say that for some reason the throttle had lost all its settings, and they needed to reset everything for a cost of $200. Sadly, that will not come out of the $500 deductible :o) he he. 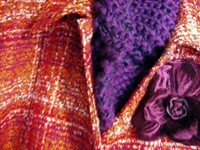 I knitted the scarf myself, of course, and the coat, complete with purple velvet flower, was only $29 at TJMaxx. It's a couple sizes too big, but that just means I can wear it over sweaters and stay especially cozy. This one might be a little gross, sorry. While waiting for the tow truck yesterday, I decided to go have lunch, since that was my original intention, and while chewing on some rice and beans, my crown came off. I tried putting it back, but it won't stay, so I've got to call the dentist and find time to get over there. Luckily, we have good dental insurance, and the oral surgeon who took care of this particular tooth is really nice and quite cute. Not as cute as Mr. Lucy, of course, but if you have to have someone drill a metal rod into your jaw, it's always good when they are nice and cute, right? How can those NOT make you happy? I didn't think I really had enough 'good' pictures to get them, but they turned out pretty nice anyway, and I love all the colors! You really do need to click that one to see it full sized. Okay, I guess I am still an optimist after all. I hope everyone had a very merry Christmas. I'm not going to say too much about mine, except that it involved fixing several things for my mother-in-law, and a soggy paper towel found in my salad (yes, it was as gross as it sounds). I've been in a bit of a grinch mood for the past week or so, but Sunday morning I leave to play for a week in Boise, where I'm going to see this person, this person, this person and this person. Oh I can't wait! Even though I have to get up at 3:30 on Sunday morning for a 6:00 flight, I'll be there in time for a big, noisy New Year's Eve party. I hear we're going to have a full drum kit, a few guitars, a mandolin, a keyboard, a harmonica, numerous iPods and an awesome Bose sound system. There may even be a visiting rock star, not including the one related to me. And then, for the rest of the week I will be going to movies, eating good food and sleeping as much as I want. I love the little sneakers! That skirt is awfully short, Evie. I'm getting you some tights to wear with it. It finally stopped raining this morning, so she wanted to go for a swing. She insisted that we open the sun roof, even though it was still only 36 degrees outside. I like her pink eyes with this outfit. In chicken news, it seems that Bear and the chickens have bonded and agreed to co-exist peacefully. One day last week I came home and the chicken coop door was wide open and their light was unplugged. I'm still not sure what happened, but the chickens were all sitting right inside the door, looking outside, puzzled by this strange new circumstance. Bear was trotting around, quite worriedly, but not bothering them at all. So this past weekend I decided to let them roam around during the day, and see what would happen. They are getting along quite well, the chickens seem to be enjoying their new freedom, although they don't roam too far from their coop, and Bear, well, he just seems interested in eating chicken poop. Disgusting, yes, but we'll work on that. He also wants to eat the stale bread and grapes that I bring for the chickens, but I guess it's only fair that they share. So we can now say that we have free range chickens! Speaking of chickens, Carol has some rescued battery hens, I think this is so great! It's such a shame that raising chickens has changed from a farming industry to a manufacturing industry (scroll down to the November 2 entry here). I'm hardly a member of PETA, and I even still eat chicken, but the way meat is raised now is a little disturbing. 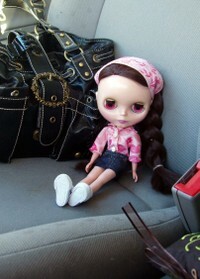 I can see that I am going to have to work on my Blythe photography skills. Here she is appreciating paint-by-numbers art. She arrived wearing only underwear, so I had to quickly make her a little dress. It's a bit of Liberty fabric I had, along with some vintage rick-rack and a sparkly vintage button. I think she may also need a little white slip. Mr. Lucy is a little worried that I am going to become one of those 'weird ladies that plays with dolls' (his exact words, not mine), but I quickly assured him that one of the reasons that I got her was that I have four nieces, and wouldn't it be fun to have lots of clothes and one of those suitcases with the rod for hanging clothes and little compartments for shoes that I could bring along whenever visiting them? They would love it, I'm sure! And of course I will love making her all those clothes and that suitcase. Now, where to find some doll sized hangers...? 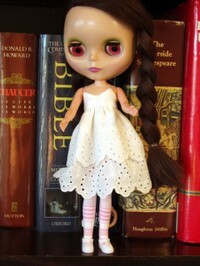 I'll be adding some Blythe links to the sidebar, just to reassure myself that I'm not the only obssessive one out there.